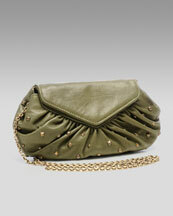 a very soft feel accented in gold studs to toughen up its lady-like structure. all-over studs for a spectacular day look. Holy crap I want one of each.